Do you remember Ice Cubes? They were delicious! So creamy.....and they melted in your mouth as soon as you put them on your tongue (and on your fingers if you handled them too much!). I recently found them at a candy store in California while visiting my son's family and I have been obsessing about them ever since. So I did some Internet research to find out what to add to the chocolate to get it to that wonderful "melt in your mouth" condition. I found out that the secret ingredient was probably coconut oil. It has a low melting point, 97–104 °F, which allows it to melt very quickly when it is put in your mouth. But what ratio of chocolate to coconut oil? I then found this recipe for homemade Hard Shell. You know that cool chocolate stuff that goes on the ice cream in liquid form and then magically becomes a hard lovely shell. Could this work in reverse? Maybe if I tweaked it a little. So this is what you need......2 parts good chocolate to one part coconut oil. (I used 2 ounces chocolate and 1 ounce coconut oil). Melt the chocolate and coconut oil over a pot of steaming (not boiling) hot water.....remember not to get any steam or water in the chocolate or disaster will follow! Stir constantly and remove from heat when chocolate is almost melted. Continue stirring until chocolate is completely melted. I poured the liquid chocolate into this cute tiny pitcher! The chocolate will seem very thin but don't worry, that is how you want it. 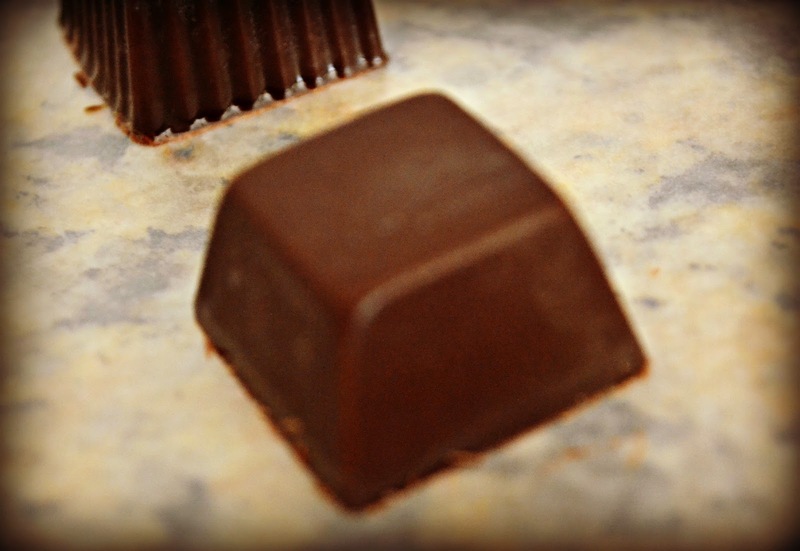 Carefully pour chocolate into molds that are about one inch in diameter. Let set in freezer until very firm. Pop chocolates out of molds onto wax paper. They should come out easily. If they don't, put them back into the freezer and try again. This mold makes the classic shape of the candy....well. almost. Soooo, the big question is how these homemade ice cubes measure up to the real thing. 1. They melt beautifully once you put one on your tongue..yippee! 2. The flavor is delicious using the dark chocolate but I think milk chocolate would be closer to the original. But can you imagine if you added a little mint oil to the dark chocolate version? Kill me now cuz I'm in heaven! Do these taste "cold" like the store bought version? After being left at room temp? Yes, the coconut oil is what gives that cool sensation! I thought it must have been coconut oil also! When I made freezer chocolates using coconut oil and....Nutella!! Try 6oz milk chocolate, 3oz coconut oil, 1tsp decaf Nescafe instant coffee, 1/4 tsp vanilla. Microwave in vented covered mug or bowl for 60 seconds. Stir until well blended and glossy, then pour into molds and refrigerate for about an hour. Anyone know how to make a ganache from the candy?